For subcutaneous vaccinations of healthy dogs 6 weeks of age or older as an aid in the prevention of disease Meets or exceeds USDA standards. Contains Type 2B Parvorirus for rapid immunity and cross protection against all recognized field strains. Parvo fraction is high titration, low passage - High vaccine titers help overcome low-level maternal antibody interference in puppies. 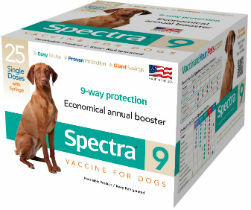 Easy do-it-yourself vaccination yields huge savings, especially for multiple dog owners, breeders, and shelters. Only vaccinate healthy animals. Animals incubating any disease or stressed due to shipping, malnutrition,or parasitism may not achieve or maintain an adequate immune response. Burn containers and unused contents. Although rare, severe allergic reactions (anaphylactoid) may occur that require immediate veterinary care.